This coffee will be fresh roasted for you. 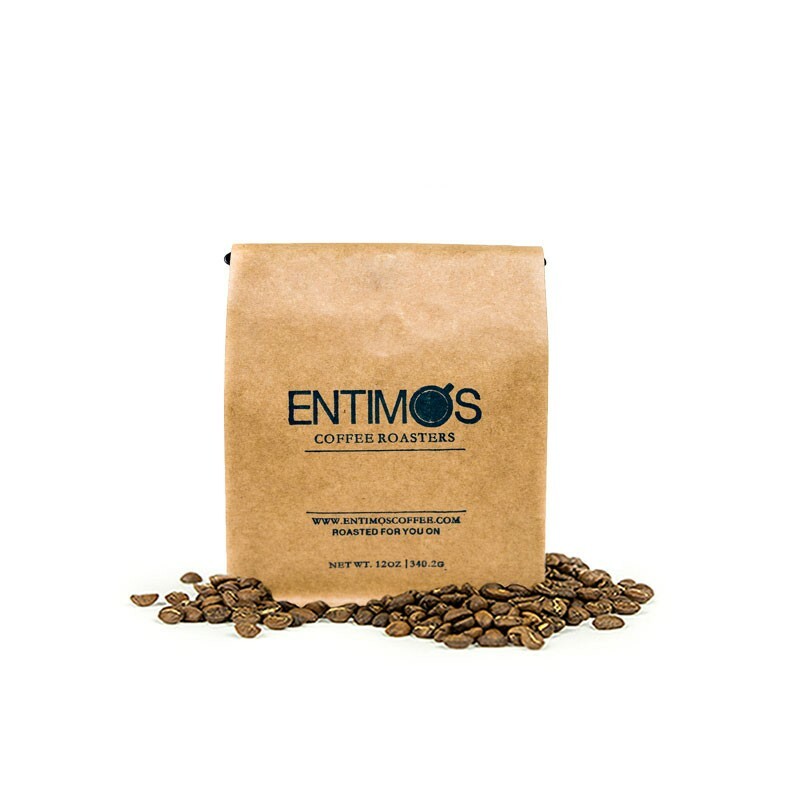 We expect Entimos Coffee Roasters will roast and ship this coffee in 1-2 business days depending on their roasting schedule. The Papua New Guinea Obura Wanonara was carefully roasted for you by Entimos Coffee Roasters. This fully washed coffee was grown by the Bebes Washing Station in the Eastern Highlands region of Papua New Guinea between 1,600 meters above sea level. We love this coffee for its nuanced notes of herbal and floral and rich overall quality. A bit too heavy on the floral tones. Loved this one! One of our favorites. Great flavor! Well balanced, not at acidic. Excellent. The Obura Wanonara is a very well rounded roast that gets its characteristics right. The nose is a pleasant, warm nutty scent, almost like sniffing a handful of warm chestnuts. Taking a sip, you are first met with the tastes of earthy herbaceous-ness. Its slightly woody and yet sweet,, like semi-sweet chocolate. Soon after, the floral notes hit, engaging the palate with its complexity. Sweetness follows with the flavors of caramel and brown sugar. It is a very medium body feel throughout. It finishes in a medium length and leaves a cocoa flavor on the tongue. Definitely an A rating for me. Via Aeropress, this is a clean cup and enjoyable. Definitely floral and we'll roasted but simple. Not the best but a coffee I would buy again. Pretty bland coffee in general. Enjoyed the flavors. We generally stray away from herbal/floral and this was extremely palatable for us. This coffee definitely starts off with a ton of flavor, the description states "nuanced notes of herbal and floral" which was accurate but ended up being overwhelming for my taste, I literally felt like I had a flower or plant in my mouth. Unfortunately this was my least favorite coffee I have received so far and I won't be able to get through all of these beans but I'm still enjoying this journey as I look for my perfect cup of coffee. I didn't find it particularly rich. I made it with pour over, Aeropress, and French press. Pour Over was the most flavorful. Ultimately, I don't care for "herbal" flavors from coffee. I believe the direct quote from my coworker was "tastes like dirty grass"
Loved this cup! Great flavor and good strength. Great as a hot brew, lacking a bit of that flavor on the cold brew side. My favorite of the first 3 I received, even the smell of the freshly ground beans was at a different level of quality. I liked the floral notes, but overall loved the warm, rich, mellow feel of this blend. 4.5 stars. Best coffee yet. Caramel and hazelnut notes with a very pleasant astringency. Brewed a great cup of coffee. Wonderful aromas. Almost a mocha / chocolate scent to the ground coffee. Very easy drinking and clean. Bright. Nice touch of acid. Great roast, loved this coffee! This coffee is little acidic, but has a great underlying flavor. This was a delicious coffee. Rich and smooth and easy to drink. The only reason that I didn't give this coffee five stars is because I don't love the herbal/floral notes that much. They aren't overpowering but they are not my favorite. I love the flavors in this coffee. I think I would prefer it if it was just slightly lighter, the richness seems a little acidic by the end of the cup. This coffee was super good. It had really tasty floral notes with a slight acidity. I really, really enjoyed it! Like it, but not as much as the first one (Mexico Sicobi), this is a little too heavy on the herbal/sour. Prefer something a little bolder. UPDATE: after a couple more days I increased the strength of the pour-over from my usual 1:15 to 1:14 and that helped make it taste a little bolder/fuller. Got more of the nutty to balance out the herbal. Like it. Would probably do 4.5 stars if possible. This is a new favorite! Perfect nuttiness, not too bitter not too acidic, the roast was a perfect brown, the brew came out just how I like it - more beans like this would be amazing. Didn't really notice the herbal or floral flavors. Really like how bright and nuanced it is. A bit lighter than I usually drink, but I liked that. Great coffee! I definitely liked this roast better than the first one. I wouldn't say it completely blew me away or anything, but I felt that it was a solid, well balanced, comfortable coffee that i could drink daily. Very weak flavor - tastes like nothing. Tried a few different techniques but yielded nothing good. Rich without the bitters, well rounded, definitely an everyday bean. Overall enjoyed this one over our first bag. This one was more well balanced and less acidic taste. We really didn't enjoy our first batch all that much. Enjoy this ones richness and floral tones. Absolutely loved this one, in every way possible. I definitely picked up on the floral notes, and also some dark chocolate (though that may have just been in my head). I would for sure like to see some more like this, but really want MistoBox so that I can try a wide variety. I don't really want to hone-in on what I really like and continue to get more of the same. Rather I kinda want to get a sense of everything that is out there! In any case, I really did like this one - THANKS! I really tried to like this one, but no matter what I did I just couldn't get any flavor out of it. Tried it through the Behmor Brazen drip at ever increasing amounts (up to 72 grams for 1.2L), as a pour over, and evenothing through an Aeropress and just couldn't find anything there unfortunately. We've had others that at categorize as on the extreme end of light that still have some complexity, but sadly this one just wasn't for me. Pretty weak flavor. Adjusted ratios of water/coffee several times, tried a finer grind and it still produced a weak flavor each time. Very nice, very delicate roast. Taste of herbs and floral aromas. An adequate cup of coffee. Nothing too special about it. Kind of weak tasting. Nice aroma, making it a joy to wake up to. Soft and balanced almost herbal taste notes. Enjoyable cup. The first one I really haven't cared for. I prefer the dark roast varieties. Enjoyed this coffee. We were wondering is it possible to get the Brasil Fazenda Sertao again, which we received last November? Kinda miss it and want to have it again. This has been my favorite blend so far. Is nice and smooth and the taste is great from pour over. I don't know but it's just difficult for me to enjoy this one. It's too light and the notes are too exotic for my taste. Well, I like my coffee full bodied and bold, and this one is definitely not one of it. This one was kind of bland to me. Not bad, but not great. This coffee started out good, but seemed to take on a bad flavor after a few days.